Cowries are little shells that are used to unfold your past, present & future. A set of 9 hand painted cowries are used to read the future. Cowries also represent the Goddess of protection who is very powerful and connected with the strength of the ocean. 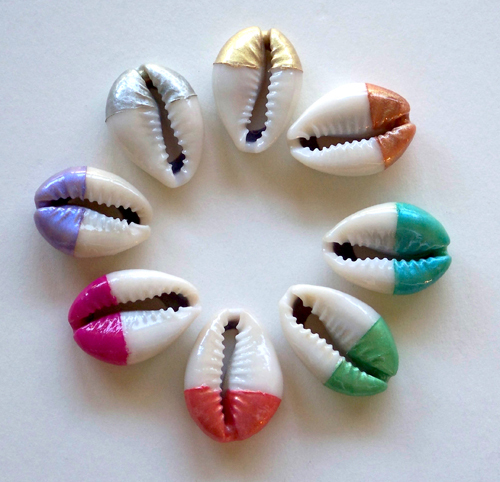 Throughout Africa, and South and North America, the cowrie symbolized the power of destiny and prosperity. These shells are serious spiritual items that deserve respect and honor. Cowries were used in the temples of ancient India as a tool for divination. There are many variants, but generally the divination entails throwing a set of cowries on a prepared chart or table and interpreting the patterns that result.